Development of intestinal inflammation–associated granulomas in the absence of IL-4 and B cells. (A–D) In αμIL4TKO mice (24 weeks of age), granulomas are detectable within the colonic mucosa (A) as well as in the ileocecal areas (B). In contrast, granulomas are undetectable in the age-matched WT (C) and αμDKO (D) mice. 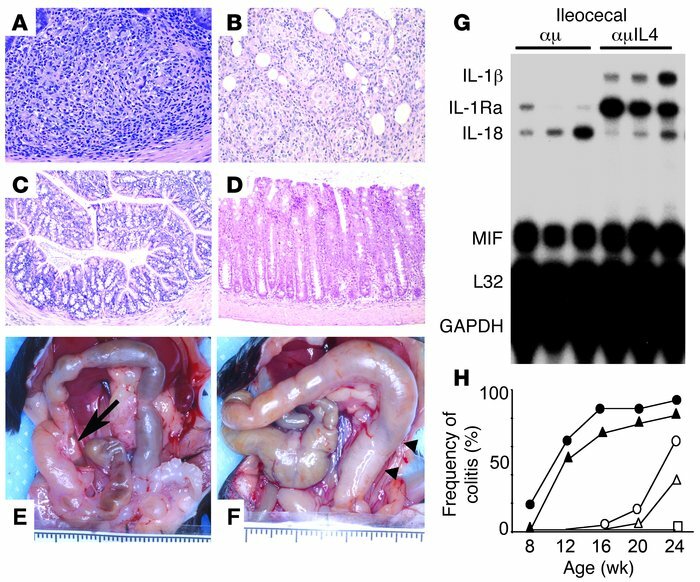 (E and F) Gross features of the large intestines of αμIL4TKO (E) and αμDKO (F) mice at 24 weeks of age are shown. The inflammation is mostly restricted to the ileocecal junction (arrow) and proximal colon in αμIL4TKO mice whereas the inflammation involves the entire colon, in particular the distal colon (arrowheads), in αμDKO mice. (G) RPA shows expression of proinflammatory cytokine (IL-1β) in the ileocecal junction of αμIL4TKO (αμIL4) but not αμDKO (αμ) mice (24 weeks of age). Data are representative of 2 individual experiments. (H) Frequency of colitis in WT (open squares, n = 168), TCRαKO (open circles, n = 222), αIL4DKO (open triangles, n = 144), αμDKO (closed circles, n = 218) and αμIL4TKO (closed triangles, n = 104) mice at various ages are shown. MIF, Macrophage migration inhibitory factor.